The Adjustable Treatment Table with Armrest, by Winco Manufacturing, is specifically designed for a physical therapist or chiropractor office where massage or vertebrae manipulation is conducted. This table provides the patient a comfortable resting area with an opening for their face and resting platforms for their arms. The durability and aesthetic design elements are quite evident both in the quality materials that make up this table and the simple integrated mechanisms to make the task of vertebrae manipulation easier. 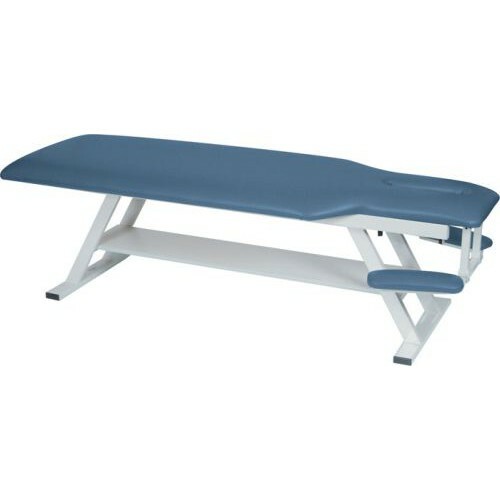 The table delivers a degree of patient care with the amount of soft padding it provides. The table surface and face rest is constructed of 2 inches of medium density foam. The foam is covered and protected by a colored vinyl cover, which makes the surface easier to clean and sterilize. This cover can be custom ordered as far as color choice. See the adjusting table color selection sheet and send to Vitality Medical. The frame is made of high quality steel and is painted with a light powder coat. There is a paper holder to roll out a section for each new patient. The frame is powder coated dove-gray. The frame and platform supports patients up to 400 pounds. The feet can be adjusted to level the table to eliminate wobbling on an uneven floor. There are two frame types: regular and with shelf (8600SH). The shelf allows a space to keep supplies close at hand. The table allows a patient to lie prone for physical or chiropractic adjustments. The face cutout allows the patient to put their face down and be able to breath and talk. The table has a armrest for another level of comfort. With a paper holder, the surface can easily be refreshed with new sections of exam paper. The frame is made of high-grade steel to last a very long time. The frame has an optional shelf. The padding is 2 inches thick with a option to choose an assortment of colored vinyl.